This session of Cook the Books is being hosted by Claudia of Honey From Rock. Claudia chose a memoir written by Isabel Vincent, Dinner with Edward. Claudia said that since our last read, Stir, was a memoir about physical healing she thought she would share a book that talks about food helping with mental and spiritual healing. In Dinner with Edward we meet Isabel who recently transported from Canada to New York for work as a reporter for, what I like to call, a Gossip Rag. Isabel needed a foot in the door for her journalism reporting career and this seemed to be it. The move and the job is hard on her and her family. Her marriage is falling apart, she has little time to spend with her daughter and her job and boss are very demanding. Nonetheless, when a friend requests that Isabel check on her recently widowed father every once in awhile, Isabel agrees and an unlikely friendship is formed. Isabel does not come across as a very likeable character however Edward makes up for it in spades. Edward is a loveable, caring, concerned father figure for Isabel. He comforts her with food, drink, hugs and fatherly advice. She comforts him with visits and assistance with dinner parties that helps him to cope with the loss of his dear wife. It is a touching story, and to be fair to Isabel, it isn't really a story about her life per se, so we don't really get to know her or the background behind the decisions she makes. I think Isabel wrote this story solely as an homage to Edward and she portrayed him perfectly. 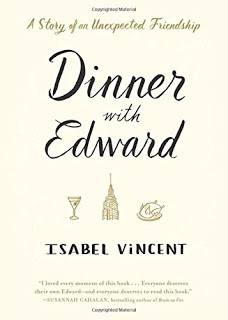 Each chapter of the Memoir started with a menu of a meal that Edward had prepared for Isabel when she visited. There were no recipes but the menus and description of the foods was lovely. Scallops was not a dish that made the menus listed in the memoir but I can certainly see Edward serving these up with a glass of White Bordeaux. 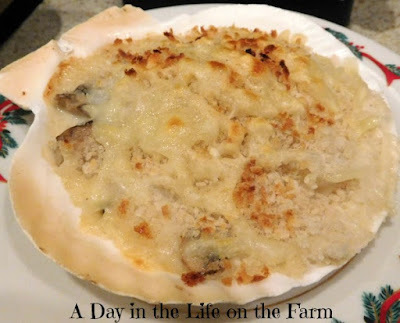 While the name and presentation are fancy the dish itself is quick and easy. It makes a very impressive first course for a dinner party. I have also made crepes with the filling and served them as a main course. Delicious. 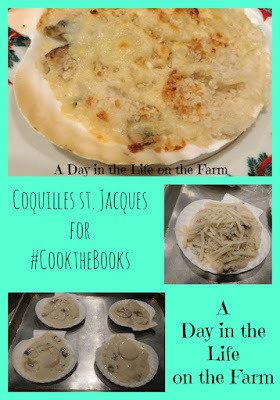 I am also sharing this review and recipe over at Foodies Read where I and many like minded bloggers link up our thoughts on books with Food themes. There are many different recipes out there for Coquilles St. Jacques. I am partial to this one from Epicurious. Place the water, wine, parsley, bay leaves and thyme in a large saucepan over high heat and bring to a boil. Reduce the heat to low, add scallops, cover and simmer just until cooked through, about 5 minutes. Remove the scallops with a slotted spoon and set aside. Add the mushrooms to the poaching liquid and simmer, uncovered for 10 minutes. Remove mushrooms with slotted spoon and set aside. Remove poaching liquid from heat and remove the parsley, thyme stems and bay leaves. Set aside. Melt the butter in a medium saucepan. Whisk in the flour and allow it to cook but not darken. Over low heat whisk in the reserved poaching liquid until smooth. Add the heavy cream and continue to simmer and stir until thick and creamy. Season with salt and pepper to taste. Cut the scallops into 1/2" thick slices and add to the sauce along with the mushrooms. Stir gently to combine. This so reminds me of a dish my mom used to make. She had a collection of scallop shells, which I totally forgot about. Thanks for this recipe and memory! Great choice of recipe, Wendy. This dish has a special place in my memory, because I remember first seeing it as a child and it looked remarkably exotic. Thanks Simona, glad I prompted a happy food memory. Beautiful - Edward would love this! I think so too, Amy.